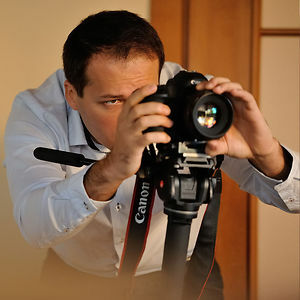 If you're getting married or if you're hosting an event, you might as well call Calin Manescu to capture it on video. You won't regret it. And you don't have to take my word for it. If companies like Sony, Audi, Kraft Foods and others, hire him for promo videos, advertisements and what not, there must be solid value to his videography, right? He's probably the best professional videographer in this part of Europe and he's here to inspire us. I'm grateful for his generosity and I certainly hope to learn more about shooting and editing videos by working with him (we live in the same city). For editing, I use the Adobe suite (CS5 and CS6). For the basic montage (simple cuts) I use Adobe Premiere and for more complicated stuff (titles, tracking, area color correction) I use Adobe After Effects. I chose Adobe back in 2009 when I switched to shooting with DSLRs. At that time, Adobe used to handle DSLR footage the best (H264 compression). Until 2009 I used Avid and Adobe. Why do I still use it? Because it covers most of my needs. And it's not worth my while to switch the workflow/editing software - I'd rather spend that time shooting or directing. I haven't attended any video/cinematography courses. At some point I felt I wanted to express myself trough moving pictures and I perused the internet for information. One thing is certain: Google is my friend. At first I worked alone and that helped me to treat each project with responsibility and maturity (if something didn't come out good, there was just one person to blame: me). Later though, I realized I'd evolve too slow without a team and I started to keep an eye open for other "dreamers". Currently, I cannot conceive a shooting without an assistant. Honestly, I'd like that a lot! I know my limits though and I still have to learn the craft. I'm gonna take it from point zero and hopefully we'll be releasing our first short film this year. Hmmm... Though question. If you're a self learner (autodidact), you can't learn to shoot without editing and you can't edit without shooting first. I think we, as videographers, need to master both areas. Anyway, if I really need to give an answer, I'd say filming (being in the middle of the action, taking the pulse of the moment, looking for a new subject, reinventing myself). If there is no script for a live event, the power lies within the hands (and eyes) of the cameraman. 7. 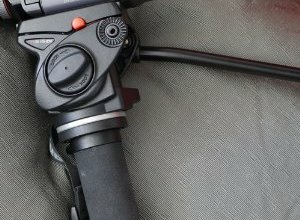 Which is the most important piece of video gear you use, apart from your camera? 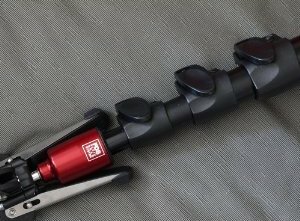 The answer is clear: the Manfrotto 561BHDV Monopod. Hard to say. I try not to think about the amount of effort as long as I like the content output. There are takes that push you to the limit, shooting sessions that drain you completely and projects that give you immense satisfaction no matter how hard you work. For this particular video (above), there was a lot of work in filming even though the result could have been better. But it was a live event which had sports & athletes as subject and we shot it with DSLRs. The amount of effort you pour into a project is in direct proportion with your emotional involvement as an operator/director/editor. I love this project specifically because of the people who acted in the film. It was a complex project involving directing, filming, editing and it culminated with the premiere of the movie. It was a special moment which we enjoyed together. I recommend commitment, passion and patience. The most important thing is to know the rules so you can intentionally break them. I believe each beginner should have a mentor from whom he/she could steal the craft. The influences of that mentor might appear in your work but I think this is the way towards professionalism. Once a videographer becomes a pro, he/she will inevitably develop his/her own style and bring it to a higher level. If you have any remarks to Calin's work or any question whatsoever, drop a comment and I'll do my best to get the answer from Calin. You might ask about cameras so I can tell you he's shooting with Canon 5D Mark II, Canon 5D Mark III, Konova slider and a Flycam stabilizer. He also uses GoPro HD wearable cameras. Very impressive work by Mr. Manescu! His work is so far ahead of where I'm at but this interview reassures me it's possible to reach. My one question would be, "What's the one camera he dreams of one day purchasing and why?". Thanks, Manny! We should thank Calin for his time. Sure thing. I'll ask him. I wanna go for RED Epic. Why? Yeah, I'm seeing a lot of pros getting Red cameras. Slo mo is definitely something we all love!